After months of violence and growing political and social instability in Burundi, caused by the decision of the president to seek a third term re-election into office, which has seen the death of over one hundred civilians and the assassination of an opposition leader, there is still no sight of an end to the deadly impasse. 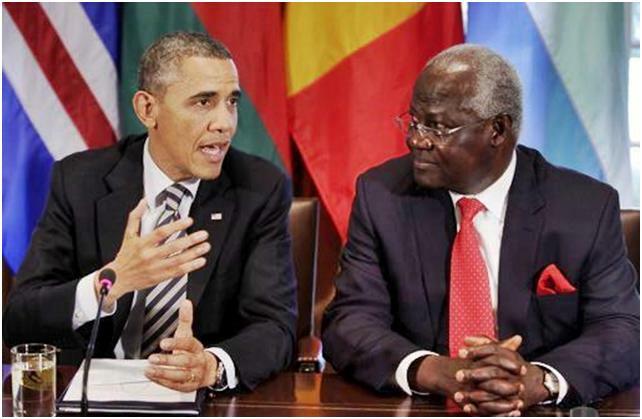 (Photo: Wise words from Obama to Koroma of Sierra Leone). In far away West Africa, alarm bells continue to be sounded as cronies of president Koroma of Sierra Leone, discuss plans for a national referendum on the issue of whether Koroma should be granted a third term in office. Koroma himself is beginning to lose the appetite for a fight that may ensue, should he decide to tamper with the country’s constitution in order to facilitate a third term ambition. In Burundi, president Nkurunziza is digging his heels ever more deeply into the heart of the country’s national peace accord – the Arusha Agreement, risking another bloody civil war. But president Obama is insisting that there is no place in democracy for the violation of national constitutions in Africa by despotic leaders. “The U.S. Government reiterates its position that the Government of Burundi should adhere to the tenets of the Arusha Agreement, to include the provisions on term limits. “The Arusha Agreement, which was carefully negotiated and accepted by most parties and sectors of Burundian society, brought an end to years of tragic civil war and established the foundation for Burundi’s post-conflict recovery. “President Nkurunziza’s decision to disregard the term limit provision of the Arusha Agreement has destabilized Burundi and the sub-region, triggered violence, and endangered Burundi’s economic well-being. “The government’s troubling actions to severely restrict political space and press freedoms, violently disrupt political protests, pressure the Constitutional Court and Electoral Commission, and reported use of an armed ruling-party youth militia to intimidate protestors and political opponents contradicts the basic principles of democratic governance and starkly contradicts President Nkurunziza’s claim that he is dedicated to respecting the Arusha Agreement and the rule of law. “The United States echoes the East African Community’s calls for a postponement of the elections in Burundi, urges all parties in Burundi to cease violence and exercise restraint, and calls for the urgent disarmament of all armed youth groups allied to political parties. 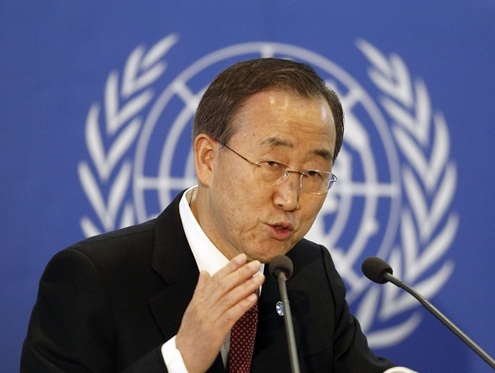 “The Secretary-General remains concerned about the potential for violence in Burundi to escalate further. He reiterates his call for calm and restraint. “The Secretary-General urges the Burundian authorities to abide by their international commitments with respect to human rights, including the right to peaceful assembly. He calls on the authorities to ensure that the security forces avoid the use of excessive force in handling demonstrations. He stresses that those responsible for ordering or committing human rights violations will be held accountable. He notes that the Security Council intends to consider the various tools at its disposal to safeguard peace in Burundi and ensure accountability. “The Secretary-General encourages Burundian stakeholders to resume in earnest the consultative political dialogue facilitated by his Special Envoy, Said Djinnit. He hopes the parties to the dialogue will implement, without delay, the confidence-building measures already agreed. Despite the failed coup attempt on 13 May, popular mobilisation against outgoing President Pierre Nkurunziza’s third term has not abated, and confrontation between the government and the “Halte au troisième mandat” (Stop the Third Mandate) street movement is intensifying. Over 90,000 Burundians have fled and a cholera outbreak has been declared in the most populous place of refuge in western Tanzania. As international pressure on the president continues to fall on deaf ears and the government reiterates its intent to hold municipal and legislative polls on 5 June, and the presidential election on 26 June, all elements of an open conflict have fallen into place. Delayed elections are not sufficient to avoid a rapid escalation of violence, a political and security climate conducive to free and peaceful elections must be restored. The East African Community (EAC) summit on 31 May in Dar es Salaam, Tanzania is the perfect opportunity to reflect on, and react to, this reality. The week following the attempted coup saw the government’s radicalisation and attempted arrests of journalists and politicians. Protesters responded to the “Halte au troisième mandat” movement’s call for a resumption of protests in Bujumbura on 18 May with fervour. Diplomatic initiatives meanwhile have not yielded any progress. The dialogue between the government and the opposition established by the UN special representative, which was suspended a few days after the assassination of opposition figure Zedi Feruzi in the Ngagara neighbourhood of Bujumbura on 23 May, remains fragile. The opposition has just announced that it will not participate in the elections. In this climate of fear and uncertainty several scenarios are possible for Burundi’s immediate future, ranging from the highly improbable withdrawal of President Nkurunziza’s candidacy, to the significantly more dangerous path toward a more or less violent, and intractable, conflict. 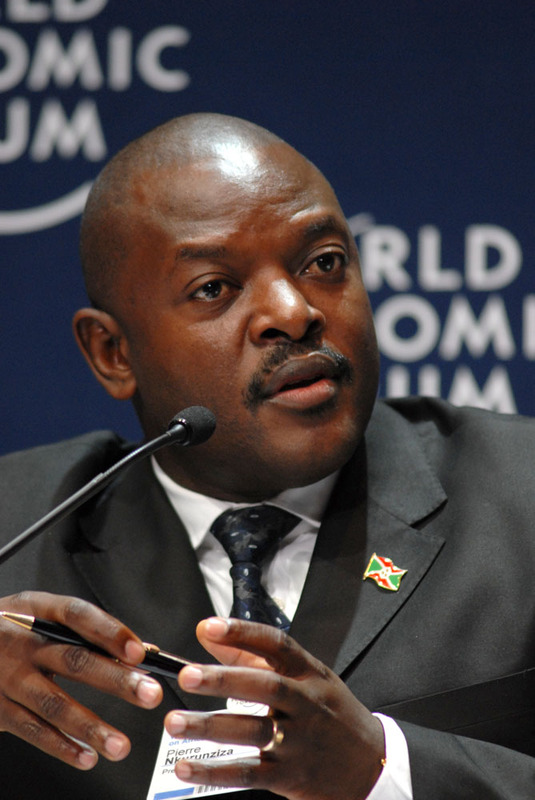 During the EAC summit, the presidents should urge the president of Burundi to postpone the June elections. They should also advocate for the creation, under the guidance of the UN special envoy, of a new electoral calendar that addresses both opposition demands and those of the current government, while ensuring that the security and political conditions necessary to hold elections are restored. Those conditions include the release of individuals arrested during protests, the reestablishment of freedom of expression, the right of opposition parties to gather, freedom of information for independent media, the acceptance of the deployment of human rights observers from the African Union (AU) and the proportional use of force by security forces. Certain media outlets, as well as speeches by political leaders should be subject to close monitoring, notably by civil society and the International Criminal Court (ICC) prosecutor, in terms of incitement to ethnic hatred. 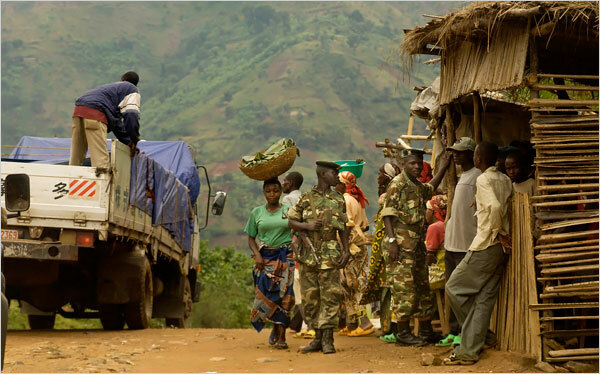 Screenings of Burundian personnel sent for peacekeeping missions should be reinforced to prevent the participation by the Imbonerakure and Burundian security forces who took part in recent violence. Finally, UN and humanitarian agencies should launch humanitarian operations in western Tanzania and southern Burundi to end the cholera epidemic. Concerning development aid, Burundi’s donors, should follow Belgium’s example and publicly announce changes to the terms of their development aid and their intention to reorient it toward Burundian civil society. They should also suspend all budgetary aid to the current government and reallocate a portion of institutional aid to humanitarian aid for Burundian refugees. The European Union (EU) should, without any further delay, initiate internal consultation relative to stipulations contained in article 96 of the Cotonou Agreement. If these consultations concerning Burundi’s respect of clauses contained in article 9 are inconclusive, the EU should suspend its institutional aid, specifically its state building contract (143 million euros), which includes budgetary aid and sectoral support (judicial, public finance and decentralisation). The EU should further increase its financial support to civil society and its humanitarian aid to Burundian refugees. On a judicial level, the ICC prosecutor should open an investigation into the violence and assassinations carried out since the protests began, and establish the responsibility held by the Imbonerakure leadership and Burundi’s security services. Concerning participation in peacekeeping missions, the AU, UN and Burundi’s other international partners should warn President Nkurunziza and his military command that the involvement of Burundian troops in these operations across the continent will be under review. “The regime in Burundi is becoming rapidly more authoritarian as President Pierre Nkurunziza continues to push for a third mandate. Rhetoric and frictions that led to war and massacres in the past are returning. Only a few weeks may remain to try to make sure that the last ten years of peace do not become a mere interlude between two wars,” warns Thierry Vircoulon, Central Africa Project Director of the ICG.